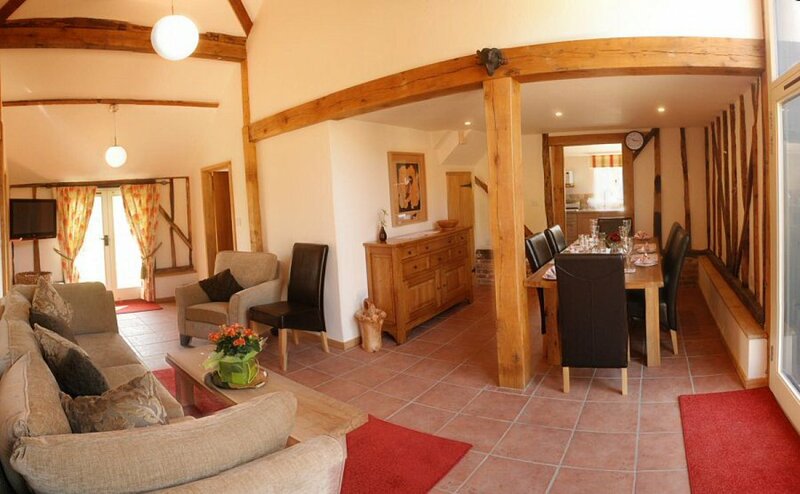 Self Catering Suffolk Barn for up to 6 people in three double bedrooms. 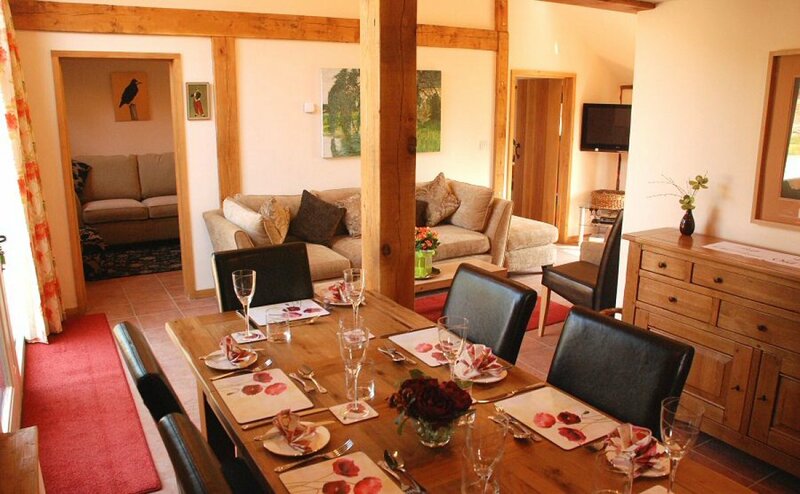 Woodside Barn is lovely - an old timber frame barn sensitively converted to a very high standard in complete sympathy with this centuries-old structure and yet providing all the modern comforts and conveniences, including central heating to radiators, Wi-Fi and underfloor heating. Located down a little lane on the edge of a small Suffolk village the Barn offers real rural peace and quiet. There are views across the countryside to front and rear. 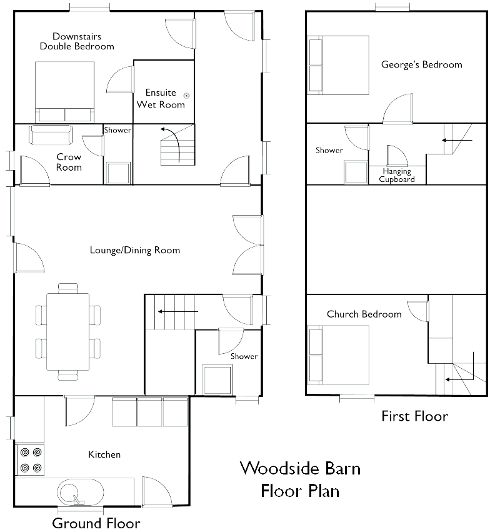 Off the entrance area is the Downstairs Double Bedroom (photo) with exposed beams. The entrance area leads to an inner vestibule with seating plus local information at a table where the chess set stands. From this vestibule easy carpeted stairs, the stairway made light by a velux window, lead up to a landing off which is a built-in full-length storage cupboard with hangers, a shower room and George's Bedroom (photo). This lovely room has country views from the window and is open up to the roof, with exposed beams. Spotlights and touch-tablelamps enhance its cosiness. This room is large enough for the travelling cot - with extra thick mattress for comfort. Door from the inner vestibule to the Main Living Area (photo), which is light and airy, fully open up to the roof and with a dining area seating up to eight at the table. At one side of the room french doors open to outside paving and grassy area, whilst at the other side a door in the glass panels opens onto the car parking area. There are full length curtains at both doors. In the living area there is a triple-seater settee and other comfortable seating, coffee table, a small selection of games and a flatscreen TV with Freeview and DVD player. Off the living area is the Crow Room (photo), a 'quiet' room with exposed beams, furnished to include a double sofa bed. A shower room leads off. The Crow Room can become an additional bedroom with own en-suite facilities (if required). furniture there is a cupboard with hanging space and hangers. The large table in the Dining Area (photo) will seat up to eight, with crockery and cutlery for up to twelve housed in the sideboard. The dining area features exposed beams and downlighters for relaxed gathering together for meals. The household necessities such as hoover and ironing board are in the nearby understairs cupboard. From the dining area a door takes you into the Kitchen (photo). 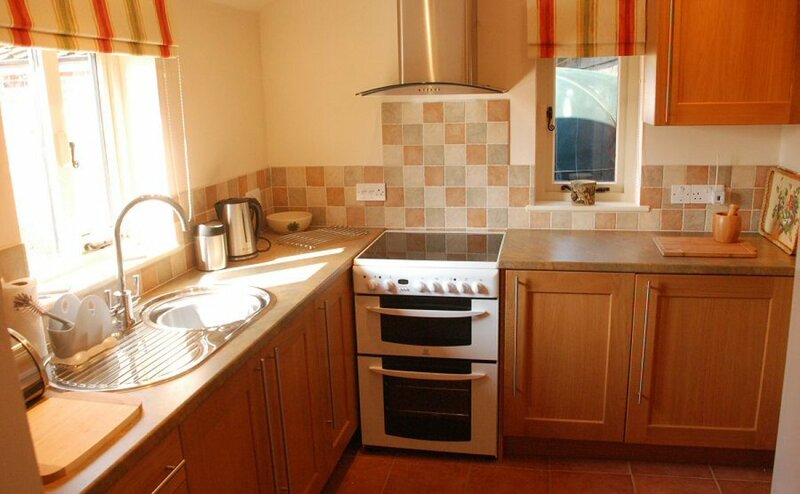 This room is well-fitted with cupboards and storage, cooking and kitchen utensils. There is an Indesit electric cooker, Hotpoint fridge/freezer, Hotpoint washer/dryer, dishwasher, microwave, toaster, kitchen block and usual kitchen paraphernalia. The window at the sink looks out over a paved area with a washing line for use if needed (to dry off those beach towels perhaps). Highchair provided if required. Door to outside paved area. Access from the lane (complete with ford) is by a short farm track with ample parking and turning space right by Woodside Barn. The immediate Barn surroundings are paved, with outside lights. There are grass areas to enjoy, for outside games and the barn has its own enclosed private garden area with garden furniture and newly planted trees. The owner's garden is adjacent, and although this is separated by a hedge from Woodside Barn, parents should be aware that there is an unfenced pond in the owner's garden. Woodside Barn is part of a complex of farm buildings and the farmyard, driveway and surrounding fields continue to be farmed and are therefore not suitable as a playground. The owners of Woodside Barn wish to ensure you have a happy stay and so are keen to be flexible about the use of the outside space and are happy to discuss your requirements. All power and heating included. Tariff includes towels and linen but please bring own beach towels. Arrival 4:00pm, departure by 10:00am please. Please discuss any special requirements with the owners. Babes in arms and children welcome. SatNav ref IP17 1PU .